Nebraska has many outstanding bakeries scattered across the state, each with their own twist on the famous classics. If you’re ready to hunt down the best cupcakes, pastries, or donuts, here are the 10 best bakeries in Nebraska to indulge. The Olsen Bake Shop is a classic neighborhood bakery and Omaha staple. Get there early for the best selection of donuts and pastries—you won’t be disappointed! The Grateful Bread in Lincoln, Nebraska, is a small, family-run cafe and bakery and 100 percent vegetarian. The ever-changing menu features an assortment of baked goods and lunch items made with fresh, in-season ingredients. This modern, stylish sweets shop in the heart of downtown Grand Island, Nebraska, is the perfect place to visit for gourmet sweets, pastries, and specialty coffee drinks when you want to treat yourself. When night falls, The Chocolate Bar also serves up desserts and drinks. If you’re ready to indulge in artisanal breads and pastries, then the Culprit Cafe in downtown Omaha, Nebraska, is the place to go. Everything is hand-rolled and baked in-house daily with locally-sourced ingredients. So, there’s never a shortage of excellent baked goods to choose from. Inspired by Midwest German cuisine, The Mixing Bowl in Gering, Nebraska specializes in home-cooked food just like Grandma used to make. Coffee lovers can also enjoy a full coffee bar at this small-town gem. Le Quartier serves up a taste of France right in the heart of Nebraska. 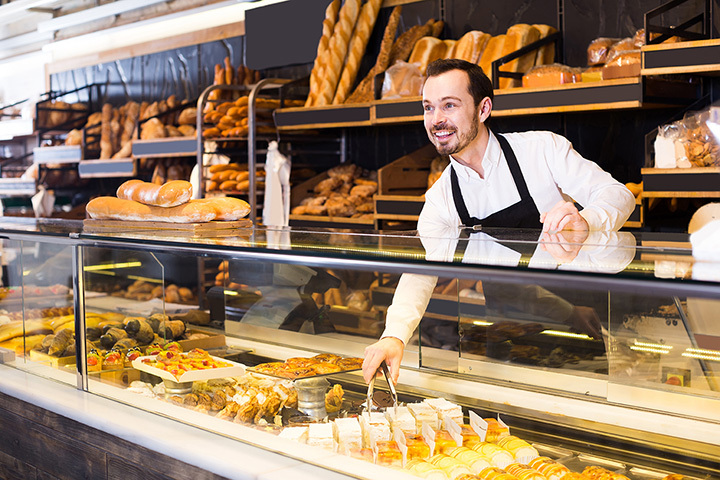 After studying in Montreal and Paris, the bakery’s owner, John Quiring, decided to start churning out freshly baked breads, Danishes, macarons, and flaky croissants for Lincoln residents. At this sweet bakery favorite in Omaha, Nebraska you’ll find scones, cinnamon rolls, muffins, lemon bars, and more. Everything is baked from scratch daily, so be sure to stop in early if you want to grab a Sweet Magnolias’ treat! This family-run donut shop in Kearney, Nebraska, is famous for its classic donuts and giant rolls. Each pastry is reasonable priced and definitely tasty! This popular bakery in Lincoln, Nebraska, offers baked goods that cater to all types of diets. Vegan, dairy-free, and gluten-free treats can all be found here. Each pastry is artfully designed in beautiful colors and will please both your eyes and appetite. Connie’s Blair Bakery in Blair, Nebraska, specializes in pastries, cookies, and everything in between. If you can’t decide what to order, the glazed donuts and delicious apple fritters are perfection.